Eating all the right things but still finding it hard to lose weight? It may have to do with your portion sizes. We are much fatter today than we were 20 years ago because we are eating more and exercising less. But it's not just because we can't resist putting our hand in the bag one more time for that extra Oreo, or going back for an another helping of pasta. That does have a lot to do with it, but it turns out we are also unsuspectedly eating and drinking more than we used to, because we are getting served larger portions and don't even know it. Portion sizes have ballooned of the last few decades, along with our waistlines, and food manufacturers and restaurants are the main culprits. Take a look at the list of some of our favorite nibbles below and how they have evolved, or devolved, over the space of 20 years. 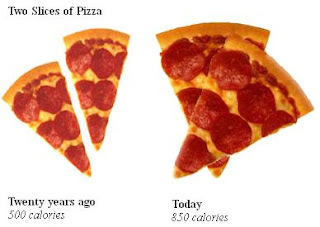 Pizza is not the healthiest meal option available, particularly if you are trying to shed some fat, so it's frightening to see how the two slices have blown up in proportion. An increase of 350 calories, artery clogging cheese and bleached white flour and you have almost half of your daily caloric intake in one sitting. Eat a couple of today's bagels a week and the diameter of your waistline might also be increase in size. Bagels are full of dense bread packed into a tiny portion, but amplify the portion and it makes it even worse. 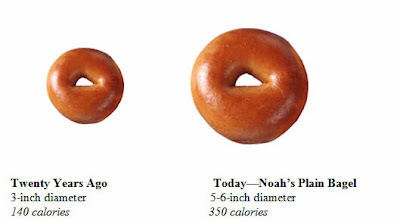 A bagel twenty years ago had around about the same calories as a piece of bread. Today's superzised variety is closer to 4. You can still buy smaller bagels at the grocery store which are lower in calories, but if you need to buy one from your favorite deli on the way to work, grab a whole wheat version, scoop out some of the inside and eat only half in one sitting. Not only are portion sizes of coffee now out of control, but they are bombarded with large dollops of cream, flavored with article chemical flavorings, and blended with enough sugar to be classified as a candy bar in a cup. A huge difference as you can see, but the comparison is made against a medium coffee with 2%. Make that a large with full fat milk like most people do and you can kiss goodbye to running along the beach this summer and hello to rolling along it. 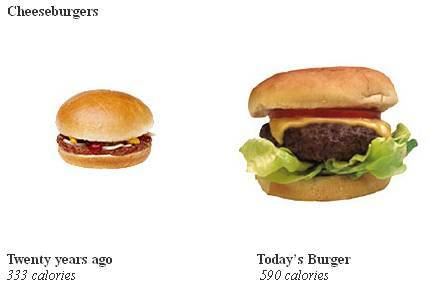 It's not just the unhealthy items on the menus that have increased in size. Take a look at the once humble turkey sandwich which has grown by 500 calories. The turkey meat is now layered so high you can barely get your mouth around it, and is doused with large amounts of fatty mayonnaise and cholesterol popping sodium, that takes this once healthy go-to dish, to meal that will see you on a treadmill for close to an hour just to burn it off. This should come as no surprise. You can't order a small burger anywhere these days even if you tried. Even this example above is very conservative. It shows only an increase in a couple of hundred calories, but head to any fast food restaurant today and you can now get burgers with more than 3 patties of beef, you can double the cheese and it could all equate to over 1000 calories in one sitting, and that doesn't even include the fries and soda most people order with it. 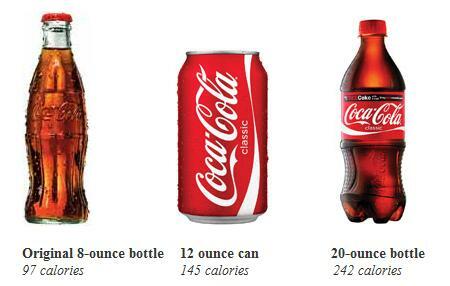 Speaking of fries and soda... the fries that would come with your meal twenty years ago would measure a modest 2.4oz. Today that has tripled to 6.9oz. 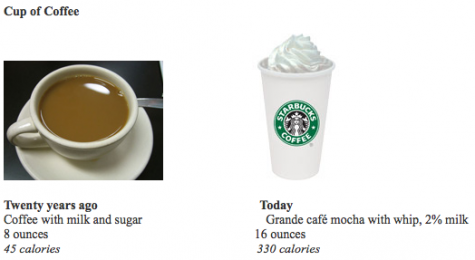 The increase of 400 calories comes loaded with nearly more saturated fat than is recommended in an entire day. Pretty eye-opening huh? Seeing exactly how portion sizes have increased over the space of very little time. 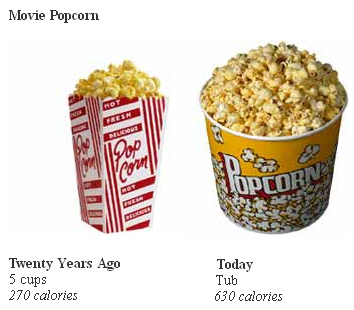 It's no wonder we are dying from more obesity related diseases today than we did twenty years ago. Even people who are avoiding the bad foods and think they are eating healthy need to keep an eye out as even foods once deemed nutritional are ballooning in size. Research shows we eat the majority of what is put in front of us, regardless of portion size, so always order a small sized meal, and if you cant, eat half now and half later, or otherwise the portions might not be the only things that are supersized. Just a word on why this has happened. The lowest cost in the food business is a lot of the time the food itself, employees, advertising, equipment, preparation, ect... all cost more than the food itself. With this in mind the cheapest way to make consumers feel they are getting a better deal is to up the portion size of menu items. It takes hardly no more prep time or overhead cost to give you a giant soda instead of a regular sized one. That is why jumbo size or extra large is such a small price jump from a small. The price of the small drink covers overhead plus a little profit every penny or nickel you spend to "up-size" is pure profit. A good way to look at it is keep the spare change in your pocket and keep the spare inches off your waist.